Week 4 – Seriously “The Weather”? Seriously!? Ok, last weekend was supposed to be a little rainy but not so cold… instead it snowed for a while and got cold. Despite that a hearty group went out for a hilly 12 mile run enjoying the snow laden trees of the Middlesex Fells, the frosted glass frozen Spot Pond, and the large baton-like thing by the side of the road by the Sheepfold. Nature at its finest. So this week we can expect some snow on the ground from a front passing through Saturday and some bitterly cold temperatures. Seriously The Weather? Seriously?! Whether its Tuesday or Sunday it seems Mother Nature is determined to toughen MRCers up for their runs this season. A marathon isn’t easy and at some point you’ll have to dig deep and push through the hard times. This month is practice for that. We’ll be heading North on Main Street into Wakefield this week for a flatter, shorter run than we did last week. The first water stop will be by Nick’s Pizza at the corner of Main St and Nahant, across from North Ave. If you’re running short turn around and head back to Brueggers for a fast, flat 10K. If you’re running longer continue up Main Street through Wakefield Center and up along the eastern bank of Lake Quannapowitt. I guarantee a stiff breeze will meet you there so pick it up and race over to the Converse parking lot. Run through there (either along the path or around the building, its up to you) and over to North Ave. When you get to the softball field turn left on Church Street, follow that to Wakefield Common and go right on Common Street. This will merge back onto Main Street and back to the water stop. After that just follow Main Street back to Melrose, back to the warmness of Brueggers. Water Stops this week. I’m a bit concerned about the cold this Sunday (of course given last week’s accurate forecast it may just be warm and sunny Sunday morning). Frigid temperatures and a windy corner is not a good combination for me. If anyone can step up and cover the stop this week, I’ll give you supplies and kick off the run from Brueggers but I really don’t want to sit in a cold car for over an hour. Anyone? Ok, Roll Call!!! Who’s in for the Frozen Fourth Run Of The Season?! Last Week’s Saturday run was a bit messy, with black ice lurking just about everywhere. There was a lot of slipping going on among the 43 runners on the route but I didn’t hear of any falls that left a mark, I hope there weren’t. By the time most people made it about 100 yards into Breakheart thoughts of alternate routes began to run through their heads. Some runners made it through to the Voc side of Breakheart and scooted out that side and improvised the rest of the route. Others turned back around and headed back to Melrose, adding on three miles elsewhere in the area. A few made it to the Voc side and turned around and came back the flat side. Nobody ran through the hilly side of Breakheart which I’m pretty sure was impossible. Thank you all for being patient and making the best of a very messy run. This week should go much better. Temperatures are warmer and we’re back to our normal Sunday Morning. We’ll meet at 8AM at Brueggers and head down Main St to West Wyoming Avenue. Running out to Brueggers we’ll hop on the Fellsway East at Grimsby’s and ride some hills to a traffic circle where we’ll turn right on Highland Ave. This will take up us towards Spot Pond. At the end of Highland you’ll find water stop number 1. If you’re running long head to the rotary by Spot Pond and turn left down Elm Street. Running short, you’ll go straight and follow the pond to Pond Street where you’ll go right down to Grimsby’s where you’ll turn left onto the LynnFells Parkway. Follow that past Melrose High School and cut up Melrose Street on your right to Main St. A right on Main will bring you back to Brueggers. Meanwhile the long runners will have taken a right on Rt 28 and run into Stoneham. They’ll cut through the parking lot at Straw Point (right before Friendly’s) and follow the route past the Stone Zoo up to the Flynn Rink back to the water stop. From the water stop the long run crowd will turn left on East Boarder Road to get back the the Fellsway East. Back over the hills they’ll run straight past Grimsby’s and follow the LynnFells Parkway like the shorter route runners did before them. Right on Melrose St, right on Main, and back to Brueggers. I’ll man the water stop on Highland Ave. Again there is a chance I might actually run a little bit so if you don’t see me, pop the trunk and grab a drink. If I get a helper (volunteer?) that wants to park at Straw Point and give out some water we’ll have a bonus stop over there for you. Let me know if you’re interested in helping out. That’s about it. Who’s in? ROLL CALL! For those that look here, remember that this week’s Sunday Long Run is on Saturday. For those of you that don’t look here (well, you’re not looking) have a friend who does look here tell you that this week’s Sunday Long Run is on Saturday. Did I mention this week’s run is on Saturday? Last week we started off the training season with a bang! Over 40 people showed up for either 4+ or 8+ miles of fun. That’s awesome. Nothing beats long runs with company. So let’s keep it up! Last Sunday I started to consider the alternate route for this week, but given the rain and one day of warm weather I think Breakheart is passable so let’s plan on that unless anyone has any evidence to suggest otherwise. We’ll meet at 8AM at Brueggers on Saturday, and remember that Saturday morning is a busier business day for them so lets try to stay out of the main walkway by the cash register. The run will head out to the LynnFells Parkway just like last week but where you turned at the lights, don’t turn this week, keep going straight into Saugus. On the left you’ll come to the Saugus entrance of Breakheart Reservation. Once there run up to the parking lot and look for the water stop car (mine again). Note though this week I may run a loop of Breakheart so I may not be there so pop the trunk and grab a drink. After the water stop short runners will turn around and head back the way they came. Long runners will run a counterclockwise loop around the park. For those new to Breakheart when you get to the beach you’ll want to continue to run to the right to circle the outer loop, going left will cut out a mile. Also if this is your first time through Breakheart be prepared for some hills, real hills, heartbreak hill training hills. After the hills you’ll pop out back at my car for a second water stop. After that stop you’ll be on your way back to Brueggers just the way you came. Waterstops, I’ll take care of them. In the future you’ll be asked to help out too. So that’s about it. Any questions? No? Great. ROLL CALL! Who’s in? As the New Year rolls in, the snow blows by, and the temperatures plummet I’m sure there’s only one thing ringing through your heads: When can I start my long runs! This Sunday we start up another round of Sunday Long Runs geared towards spring Marathons and half marathons and any other long distance ideas you have rattling around in your head. If you’re new to the long runs check the about link in the upper right hand of this page for the background info. Generally we meet at 8AM at Brueggers head out on the route prescribed for the given week. There will be water stops along the way supplying water, gatorade, and some light snacks. These will get you through this run and help you gear up to refueling on the go, a necessary skill for marathon running. All this you get for $2/week, $1 if you’re running the short route. If you want you can contribute $30 for the whole season up front and you won’t have to remember to bring your dollars every Sunday. Let me remind you that this run is a Melrose Running Club program but all are welcome to join in. If you do join in you are consenting to the fact that long distance running has its inherent dangers and you assume all risk to yourself while participating. We are not responsible for your health, you are. Let me also remind you that you are responsible for knowing where you are going. The maps for each week are available for you to print out. If you tend to be directionally challenged print one out, stick it in a plastic sandwich bag, tuck it in your pocket and hope for the best. Over the years I’ve never permanently lost a runner (as far as I know) and I don’t want to start now. We have temporarily lost people here and there and I’ve found that there is no way for me to know where you went astray so I’m not going to find you. If you do become lost, run back the way you came. The waterstop vehicles generally stay where they are until the run is done and unless you’re towards the back of the pack you’ll probably run into someone else that knows where they’re going. Each week I take a pre-run roll call. This has a few purposes: Let’s your friends know you’ll be running with us and makes them more apt to join us. Let’s me know you’re coming so I’ll remember you’re out there on the course and I won’t drive off with the water stop before you get there. Let’s me by enough supplies for the amount of people I expect to be there. My family doesn’t appreciate gallons upon gallons of water sitting in my kitchen all winter so I buy just enough for that week each week. And finally it makes you feel a little more commited to showing up if its snowing in the morning. Please take the time to answer to the roll call. Ok, I think that’s enough to get things kicked off. 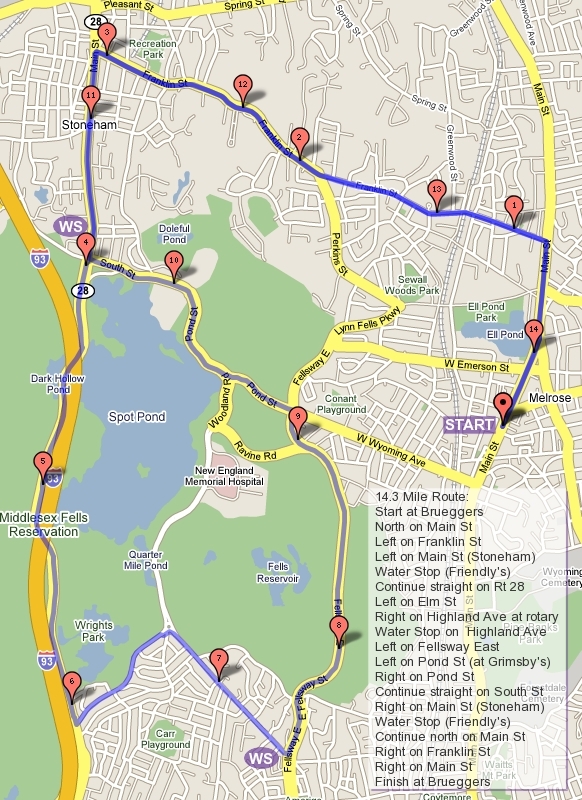 This week’s route is a run out the LynnFells Parkway to Main St in Saugus. If you’re running long you head towards Wakefield to a water stop at Wakefield High School. If you’re running shorter you turn down Howard St and head back to Main St. to Brueggers. Long Runners will continue on to Water St, over to Main St in Wakefield Center and back south on Main St until you get to Brueggers. Nice easy start to the year. So who’s in? ROLL CALL!! !